Standout account of the tight 1949 American League pennant race between the Boston Red Sox and New York Yankees, by the author of The Reckoning, The Best and the Brightest, etc. This is baseball just before its 1950's heyday: radio linked the nation, blacks entered the game, the legendary Yankee/Red Sox rivalry entered a new era as the extraordinary Joe DiMaggio neared retirement and Ted Williams ("the philosopher-king of hitting") stormed the record books. Halberstam does a splendid job of catching the quirks of these two giants: Williams' overblown ego ("No one could throw a fastball past me. God could come down from Heaven, and He couldn't throw it past me") and computerlike brain; DiMaggio's painful shyness and doelike grace. Other players, too, flourish in capsule bio graphics: klutzy Yogi Berra; Ellis Kinder, known to play while skunk-drunk; Casey Stengel, baseball's greatest practical joker; Johnny Pesky, Phil Rizutto, Bobby Doerr. This assembly of oddballs produces one of the game's greatest pennant races, as the Red Sox sprint from behind to catch the Yankees at the end of September. The season boils down to the final game of the year, each team putting a 96-57 record on the line. Halberstam keeps the tension high and the human element foremost. His one misstep is the considerable space he devotes to discussing the baseball announcers and journalists of the era--dead weight for most fans. On the other hand, A. Bartlett Giamatti makes a delightful cameo appearance as an 11-year-old Red Sox booster. 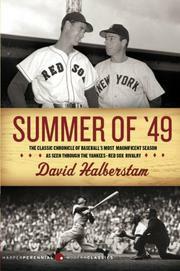 Such unexpected touches--Halberstam's eye for the exemplary detail--help make this a baseball book to cherish.